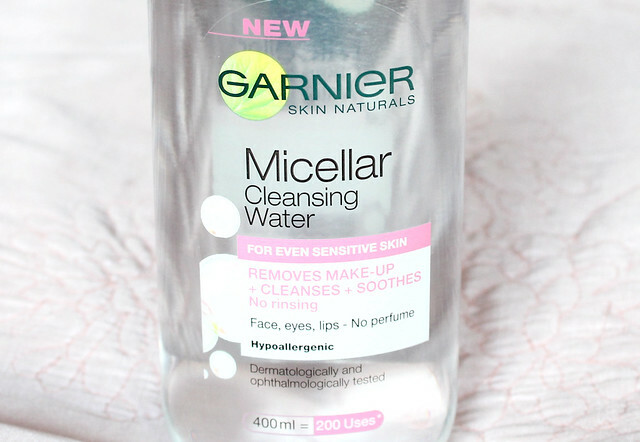 The latest addition to my Micellar water line up is from Garnier and I have to say, I think its my favourite so far. I'm sure you've all heard of micellar waters by now - Bioderma kicked off the trend and the whole beauty world went mad for it. Just incase you don't know anything about it - its a water solution that contains something (don't ask me about science) that breaks down makeup. 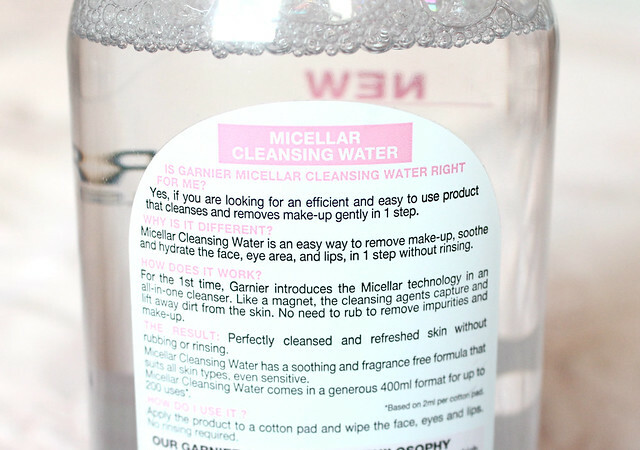 I guess its a fancy name for a makeup remover but unlike traditional removers that can contain harsh ingredients, micellar waters are very gentle yet just as effective which is why I love them so much. I've built up quite the collection of them over the past couple of years and I tend to use them to remove the majority of my makeup before doing a proper cleanser with a face cloth. 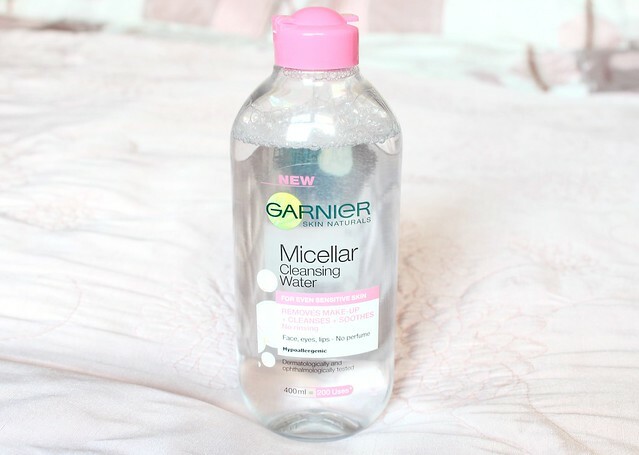 Garnier's Micellar Cleansing water caught my eye on a recent trip to Superdrug due to its cute pink lid and its ginormous size. Its a 400ml bottle which is only 100ml less than a bottle of Bioderma yet its so much cheaper. I picked it up for only £4.99 which is such a great bargain and much cheaper than other micellar waters out there that serve the exact same purpose. I've been using it for over a month now so I think I've given it a good enough trial to warrant my review. Firstly, as I briefly mentioned, I love the packaging - its very sleek and I especially love the pink lid - its so girly and cute. 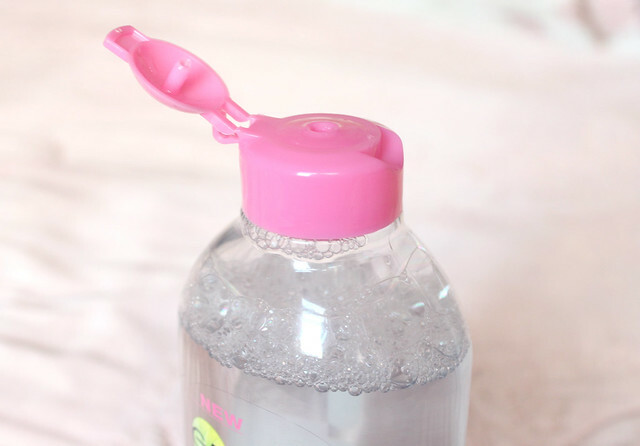 I also love how the product is dispensed from the cap - it doesn't come out too quickly like the Loreal cleansing water and its actually very similair in style to Biodera - just slightly taller. Secondly, this stuff works exceptionally well. 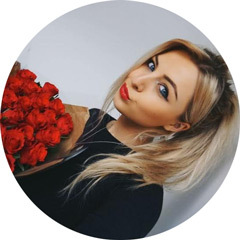 I've been soaking a cotton pad with it and swiping it across my face - mainly concentrating on my eye area to remove any stubborn eyeliner and mascara. It melts my makeup away in a matter of seconds and is very gentle on the skin. It doesn't have much of a fragrance which I like and I find my complexion is soothed and fresh looking after using it. There's not a great deal more I can say about this as its quite a simple product that's great to use as pre-cleanse (or when you're feeling a bit lazy) and it does exactly what it says on the tin. Its definitely my favourite micellar water so far - I've got no complaints. I definitely prefer it to Bioderma which is great as its much cheaper! The huge bottle will also last me a really long time. Have you tried the Garnier Cleansing Water? What's your favourite micellar water? I love this micellar water, it's so good and has become one of my skin care staples! I haven't tried any micellar waters before, but have recently picked up the bioderma one for dry and dehydrated skin. I can't wait to try it out, but might invest in the garnier one afterwards. Well this sounds rather fabulous, I've nearly run out of my Loreal micellar solution so shall pick this up next time plus it's bigger! I am currently using the micellar water solution from L'Oreal which I love. This is certainley on my shopping list for my next Boots shop..love them so much. Hope this makes its way to Canada! Oooh gorgeous! I've heard lots about the L'oreal Micellar water but not so much about this little gem!! I've never tried one myself, but plan to in the near future, now I just have to decide which one. You're right, the bottle looks pretty! I like what you wrote about this product having little fragrance in it, perfume tends to irritate my skin so this one sounds interesting! I am obsessed with this!!! It is the perfect makeup remover! I'm definitely going to pick this up. Bioderma is a bit pricey for me but this sounds great! I don't think we have it yet in Canada. I like the packaging, the L'Oréal one looks so dated! I hope Garnier will bring this here, I like Bioderma but it's quite expensive to use everyday! when i run out of my l'oreal one i'm definately going to buy this as you get so much more in the bottle for the price and i've heard that when comparing the two they have almost, if not exactly the same ingredients and i've heard better things about this one, although i don't have much of a problem with the amount dispensed etc. when using the one from l'oreal! I'm EXCITED to give this a go! Good to learn about this product. I've never seen it before--but of course we don't have SuperDrug--but I'm sure it'll turn up in Seattle some time. Pues si es mejor que la de Bioderma tengo que probarla! Sounds great, I'll definitely be giving it a try! I'll have to try this one. I've never used Bioderma, but I already like the idea of this one being a bit cheaper! I have been using this for a month or so now and I’m impressed! Far better than l’oreals version. I must say it would be hard to tell the difference between this micellar water and biodermas! I will certainly be picking another bottle up when I have run out of this one especially with such a low price! I did a comparison which you might like between Bioderma and Garnier. I definitely agree with the outstanding price difference! It is a bit crazy. I've been wanting to give this a go for a while now and after this review I think I'll finally pick it up! Thanks. Oh I want to try this so bad! So far i have used the L'oreal one and the one from Nivea. Found them both very similar. I spied this during the week, and was tempted to try it out, I definitely will after your review, thank you!